Spend your morning wine tasting in the beautiful Sonoma Valley! Visit 2 wineries and sample a selection of their offerings! Tasting fees are included! On our tour of Sonoma, you will visit two of the region’s finest wineries and sample their award-winning wines. Each winery has been carefully selected for its unique character, knowledgeable and friendly staff and lovely ambiance. On our tour of Sonoma, you will visit two of the region’s finest wineries and sample their award-winning wines. Each winery has been carefully selected for its unique character, knowledgeable and friendly staff and lovely ambiance. Your tour will begin at 8:15am at your pickup point: 1300 Columbus Ave, Holiday Inn Fisherman’s Wharf. DO NOT GO INSIDE. Meet OUTSIDE on the corner of Columbus and North Point St. at the white curb passenger pickup area. Your group will head north out of San Francisco but first make a stop at the Golden Gate Bridge for an opportunity take photos and learn about your guide and activities for the day. 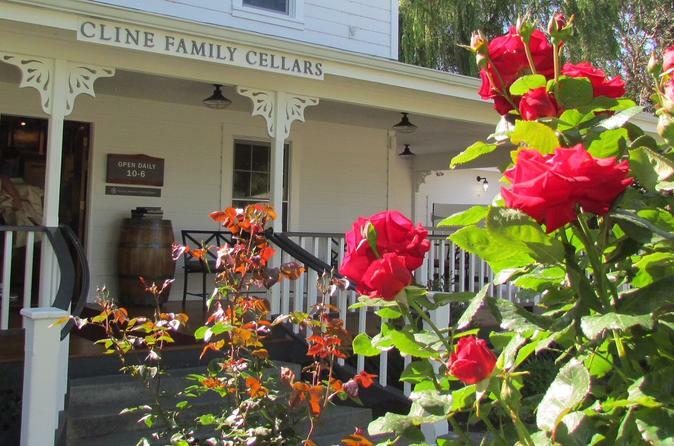 Around 9:15am, you'll depart for the wine country to enjoy tastings at Cline Cellars and Larson Family Winery. After you've had enough wine, you'll head back to San Francisco. Arrive in Fisherman’s Wharf at 2800 Leavenworth St. between Jefferson and Beach St.at 12:45pm, and you will now be on your own and free to grab lunch at one of the many restaurants in the Fisherman’s Wharf area or elsewhere.